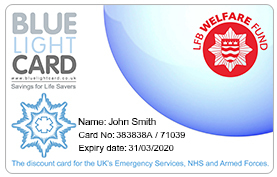 To take advantage of your Blue Light Card provided to you, please take a few moments to activate it. Once you have activated your card you will be able to login and view the many online and high street locations you can expect to receive a discount. If you already have an account your card will be linked to this, alternatively we will create a new account for you.